In the video lesson below, you’re going to get a step-by-step breakdown of how to play the classic Herbie Hancock jazz standard, Watermelon Man, on guitar. We’re going to use this as an opportunity to work out some arpeggio shapes up and down the fretboard, and some other cool tricks you can use to spice up your soloing. Don’t have time to read this post now? Get your Handy PDF Download + Backing Tracks: Get access to a print friendly version of all the exercises in this post as well as FREE backing tracks for your practice. 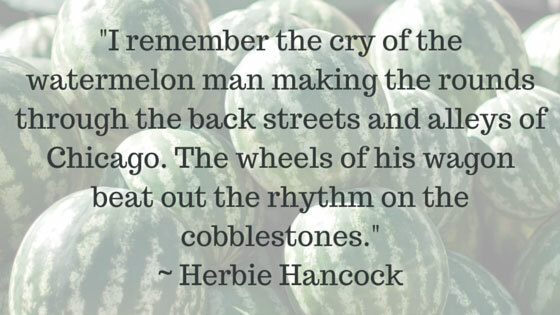 Watermelon Man was first released on pianist and bandleader Herbie Hancock’s debut album, Takin’ Off. It was so popular it even reached the top 100 of the pop charts at the time. Over the years this jazz standard has been recorded over 100 times, but my favorite version is still the groovy original recording featuring Hancock along with solos from Freddie Hubbard and Dexter Gordon. Check it out! (Note that Hancock recorded a couple of versions Watermelon Man. For this lesson, I’ll be referring to the version from Takin’ Off (i.e. the video above), rather than the funky version from Headhunters Hancock recorded some years later). This tune has an iconic piano riff that combines elements of bebop, jazz and R&B – with a pop twist to boot. We’re going to use this piano riff for some soloing ideas in this Watermelon Man guitar version. But more on that later…let’s learn the tune first! Check out the video above that includes a guitar TAB and notation of the melody to Watermelon Man as I show you how to play it. You can find a lead sheet for this tune by clicking here. Exercise: Comp with any basic chord shapes you already know along with the original recording. Jazz doesn’t need to be hard to sound good. Some players that are first getting into jazz think that they’re not allowed to use pentatonic or blue scales anymore. After all, jazz is a development of blues – but blues is still strongly at the core of jazz. Exercise: Have a go at soloing over the backing track with the pentatonic and/or blues scales below. If you solo only with pentatonic or blues scales, it’s going to get boring pretty darn quickly. So, have a go at these two easy blues licks that you can whack into your Watermelon Man guitar solos. Exercise: Memorize the licks and then play them over the backing track in whatever places that make sense to your ears. Then, mix them up with the scales from the previous step. Check out the lesson video for a breakdown of how to play the piano riff from the recording (the notation and TAB are on the video). As detailed in the video, you can take the hip double stop ideas (i.e. two notes played simultaneously) from the piano riff, and include them as yet another ingredient for your Watermelon Man guitar soloing. Exercise: Put the backing track on again and solo only using double stops to get the feel for this technique. Then, mix it up with the blues licks and the scales above. As you can see, you now have quite a few cool ideas to draw on for your solos. 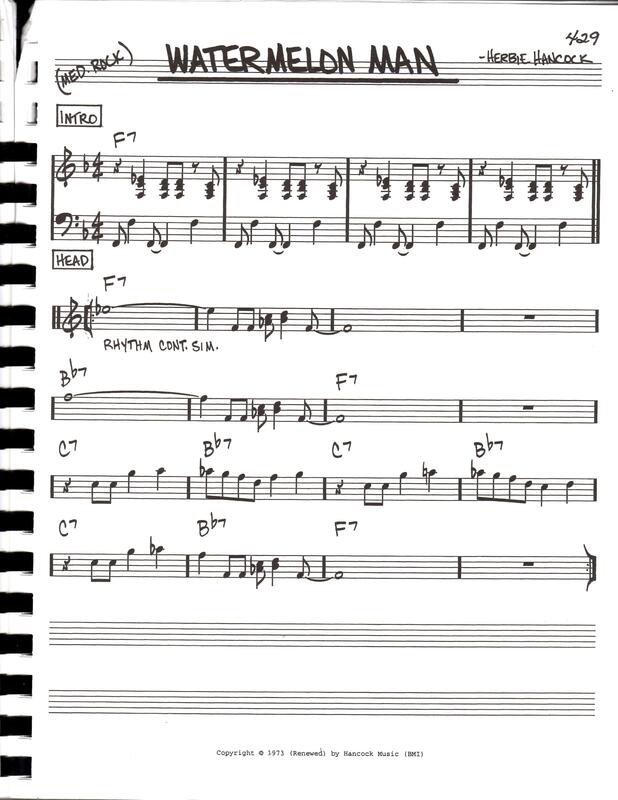 A key feature of a good jazz solo is how it outlines the chord changes. If you solo only with the scales and blues licks, it will sound a bit plain and won’t move along with the changes enough. So, to help with this let’s incorporate some arpeggios. Once you get familiar with this shape, practice moving it up and down the fretboard to match the corresponding chord change in the progression. You can move the arpeggio shape up to fret position 6 for the Bb7 chord, and to position 8 for C7. A good way to jazz up the Major 6 arpeggios is by using enclosures. For those of you that have read this blog before, you’ll know I’m a fan of these! These sound great especially on the 3rd of the arpeggios, which gives a nice bluesy sound. Exercise: Solo over the backing track, incorporating enclosures over the Major 6 arpeggio shapes. Then, mix everything together you covered in today’s lesson and solo your heart out! Fantastic! You now have this bluesy tune under your fingers. Watermelon Man is a popular standard that’s often called at jam sessions, so it’s worthwhile getting to know it inside and out. If you enjoyed this Watermelon Man guitar lesson, please share it with your friends; it would mean the world to me. Special thanks to my mentor Matt Warnock, who once showed me this innovative step-by-step approach to building up improvisation ideas over this tune. Check out his site at www.mattwarnockguitar.com. 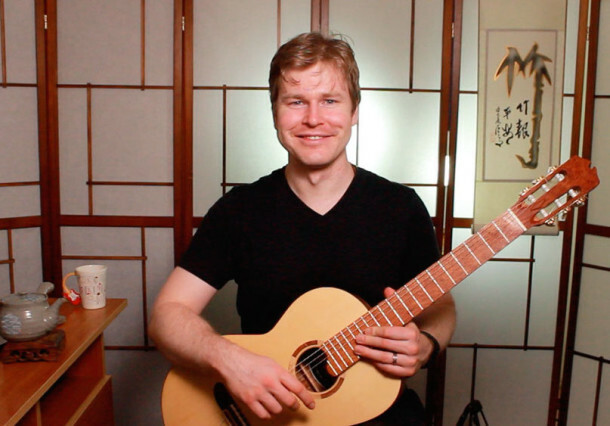 I’d also like to thank Garry Petrisic who built the amazing archtop guitar featured in the video. And finally, a huge thanks to you, the reader – I appreciate you taking the time to read this lesson. Now – go practice! Great lesson explained with Essential to understand and play. It is not given to all the “world teacher” jazz and especially blue to offer us such knowledge. Thanks very much for your kind feedback on the lesson Bernard – much appreciated! This is a great lesson well set out and very encouraging! Many Thanks.. as ever I need to get in a ton of practice. My pleasure Ollie – happy practising! Greg, I love this tune – who doesn’t? It’s not too hard because it doesn’t have changes in the key, so you can basically use one scale. Yeah, it will sound boring, but not with your tips! Another great Lesson man! Thanks! Cheers from Brasil! Hey thanks Vinicius, yes the changes are pretty standard in this one but having standard changes doesn’t mean it has to be boring to listen to – it’s what you do over the changes that counts! I was playing it in minutes. Great to hear Jim – that was the aim of this lesson, to get you guys up and running with this one without it taking a long time. Glad you found it useful! Just noticed the video of Herbie’s original version is not available. What an awesome lesson! ,, I will surely share this as well as play it and improve thanks to you my friend! Great lesson, thank you very much for this. I’m seem do be having an issue clicking on the link for the .pdf and backing tracks, all it does is take me back to the top of the page. The video you did with this is very well done.